Venice is full of unique shopping opportunities, but only if you know where to go. We’ve already talked about where to go shopping in Venice, but that was more of a general guide, this is why we are would like this post to focus on a specific kind of shopping – vintage shopping. Everyone knows that Venice is a paradise for those who love fashion, but most people do n’t know that this is not just a place for masks and expensive clothes or accessories, but also for something truly unique. 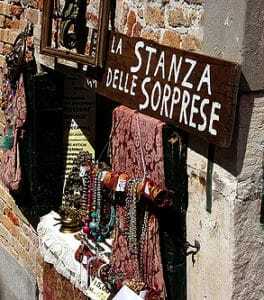 Let’s find out where to go vintage shopping in Venice through the list of shops we selected for you. The name of this tiny shop translated into English sounds like “Coco’s closet”, and once you’re inside, you can tell that is like being inside a splendid vintage wardrobe. It’s an authentic Venetian family business, run by Arianna and her daughter. Both of them are passionate about vintage, and they never stop traveling around the world searching for new items, bags, and clothes from the past. At the moment, they have two shops in Venice, one in Campo Santa Maria Nova and another one in Campo Santa Maria del Giglio, but the latter is more about luxury vintage products than the former. This place is magical and smells of paper and cardboard. If you love old postcards, books, and prints, this is the right place to do some vintage shopping, not fashion but history related. You’ll find yourself stopping by boxes full of ancient things you couldn’t imagine, that Claudio positions outside the bookshop every day, in Campo Santa Maria Nova. His shop is like a magnet, and you can’t fight against it, you’ll have to explore inside eventually! “The Surprise Room” is the next shop in the list, and Rossella, the owner, gave it this name for a very specific reason… In fact, in this shop, you can find pretty much anything you can imagine, from a 19th-century lamp to typical Italian Ceramics – and no doubt, you’ll be surprised! Since it’s located on the way between to St. Mark’s Square, it’s usually crowded, but it is definitely worth a visit. Another place we recommend for vintage shopping in Venice is Bisnonni, a shop situated in Campo Santa Maria Mater Domini, not far from Rialto Bridge (just a gondola-ride away from our hotel). It’s a vintage fashion shop, where you can buy any kind of clothes you need, moreover, it’s larger than those we’ve presented before, so you can spend inside as much time as you want (and need) without having to worry about crowds. To conclude our virtual tour of Venice vintage shops, we would like you to come into Paolo Olbi’s shop to discover a world of paper and leather. Paolo and his team produce gift articles in leather and marmorized paper. If you have to buy a souvenir for someone who’s passionate about handcrafted creations, like clipboards, phone books, photo albums or photo frames, this is the place to go. Paolo Olbi is an institution in Venice, his shop has been open since 1962 and everything he sells is unique. Can you tell how precious a gift like this would be? Now that you know where to go vintage shopping in Venice, have you decided where to head to first?